The Raekor Set Dungeon is located in Act V, the Overgrown Ruins. Teleport to Act V's town, The Survivors' Enclave. Head upwards and then to the right from the junction near the healer Anselm, and then past the merchant Powell. You will reach the entrance of the Overgrown Ruins — enter and head through the marshlands beyond. Nearing the entry to the next zone, the Blood Marshes, are two ancient pillars — the Raekor Set Dungeon's entrance will appear to their left if you have the 6-piece bonus active. The Raekor Set Dungeon's two unique Primary Objectives are to: 1) Hit 15 different enemies with a single Furious Charge 6 times; and 2) Hit 15 enemies with a 3750% damage bonus spender. The Raekor Set Dungeon is a sprawling Keep Depths tileset dungeon, with numerous dead ends and side rooms. In spite of that, your attempt paths are fairly straightforward, since the dungeon forms a large rectangular path. You can clear it counter- or clockwise without meaningful impact on your success. Fallen and Bile Crawlers — these two kinds of minor trash enemies are spread in generous packs across the map, helping with the first Primary Objective of the dungeon, and will make the bulk of the "kill all enemies" objective. Harvesters and Grotesques — these "exploding fatty" type of undead are fewer in number and appear either on their own, or near larger trash packs of smaller enemies. The extra adds that spawn from their death can add some extra numbers for your Furious Charge counter, but should not count towards the final enemy tally. Raekor's Wraths — the unique enemies of the map. They resemble Act 2's Fallen Shaman, but also have a Molten affix. 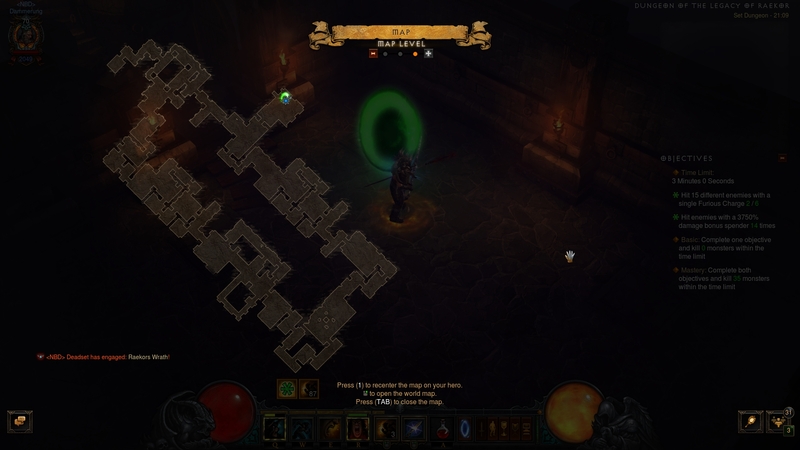 Unlike many Set Dungeons, the elites of this map are not tied to objectives, so you can kill them on sight. Beware their on-death explosion. Similarly to the Furious Charge playstyle it is tied to, the Raekor Set Dungeon is all about movement speed. Insert as many speed-buffing skills and gear as you can, while still being reasonable (i.e. Wreath of Lightning provides a movespeed buff, but has a damage proc that might kill off stragglers and jeopardize a carefully aimed charge). Since its more fiddly than the other objective, try to complete the 6 Furious Charges on 15 enemies first. Generally, once you spot a large trash pack, do not Charge them immediately, but try to form a good pull (ideally with our recommended Threatening Shout Demoralize) and pass directly through the pack. When played out correctly, they will follow you in a convenient string, ideal for a 15+ enemies Furious Charge. This tactic will net you completion of the first Objective by the first third of the map, allowing you to focus on the second and killing all enemies. If you adopt the standard Furious Charge build spender, Ancient Spear Boulder Toss, you will fulfill the 3750% damage bonus spender requirement at 5 stacks of Raekor's Charge (note the set mechanics). This means that every 5 Furious Charges (or more), you can do a Boulder Toss and expect progress on the Objective. Since there's plenty of enemies on the map to snipe with powered up Ancient Spears, worry about that objective after the first (but do not pass a good opportunity to dump Fury if you spot one). While this applies to all Set Dungeons, do your best to kill all enemies in the areas you pass through. This Set Dungeon specifically is so lengthy that even going for a second run through is not recommended. Furious Charge Merciless Assault Ancient Spear Boulder Toss 1 Battle Rage Ferocity 2 Sprint Marathon 3 Threatening Shout Demoralize 4 War Cry Charge!